The emails, leaked to media by whistle-blowers, have been rubbished by the ANCYL and BLF leader Andile Mngxitama. The barrage of emails that show the extent of influence over President Jacob Zuma, government, and state-owned enterprises (SoEs) by the wealthy, politically connected Gupta family seem genuine and should be urgently attended to by establishing a judicial commission of inquiry, the South African Communist Party said on Sunday. “No one has come out in the open and said the emails were false… that is very interesting. Furthermore, no action has been taken against the media that has been reporting about these emails. We suppose that there would be processes to establish their nature, but they do look genuine,” SACP general secretary Blade Nzimande told reporters in Johannesburg following the party’s central committee meeting. The emails, leaked to media by whistle-blowers, have been rubbished by the African National Congress Youth League (ANCYL) and Black First Land First (BLF) leader Andile Mngxitama, among others. Mngxitama has labelled the emails “fake”, claiming they were meant to divert attention from radical economic transformation for black South Africans. The emails reveal, among other things, how the Gupta family sponsored lavish overseas trips to Dubai for their business partner President Jacob Zuma’s son Duduzane, Eskom chief financial officer Anoj Singh, and Free State Premier Ace Magashule’s two sons. They also reveal, among others, how the Guptas allegedly bought Zuma a R330 million retirement home in Dubai’s upmarket Emirates Hills suburb in 2015, the same year that Duduzane bought an apartment for R18 million in Dubai’s luxury Burj Khalifa. Singh was Transnet chief financial officer in 2014 when he allegedly travelled to Dubai four times and was booked into luxury a suite at the exclusive Oberoi Hotel. Zuma and his son’s role in the state capture allegations was “worrying,” Nzimande said. “We have raised this even in the alliance, that this matter does not look good at all in terms of what is in the public domain right, even if only half of the emails are true… this is very serious; the idea of a silent coup is not far fetched. But we will not be judges, that is why we call for a judicial inquiry immediately. “The toxic role of the Gupta family, with the help from the highest echelons in the state and our movement, need to be confronted head on. We do not want any dilly-dallying and talk endlessly… we can’t be fooling around now when the country is faced with a potential serious problem that threatens to take us backwards,” Nzimande said. Nzimande’s deputy Jeremy Cronin said some cases could be prosecuted without waiting for the commission of inquiry. “What unites us is the common concern to threats to our democracy,” he said. “I think there are cases that can be prosecuted if the emails are to be taken very seriously… they point to a pattern, such as one minister sharing top secret cabinet information [with the Guptas], and that is a serious criminal offense. While we await the establishment of the commission of inquiry, there are criminal cases which can pursued… we do not have to wait for a long process,” Cronin said. The Hawks and the National Prosecutions Authority (NPA) should “wake up and overcome their factionalism” and address the criminal activities exercised through the capture of the South African state, he said. 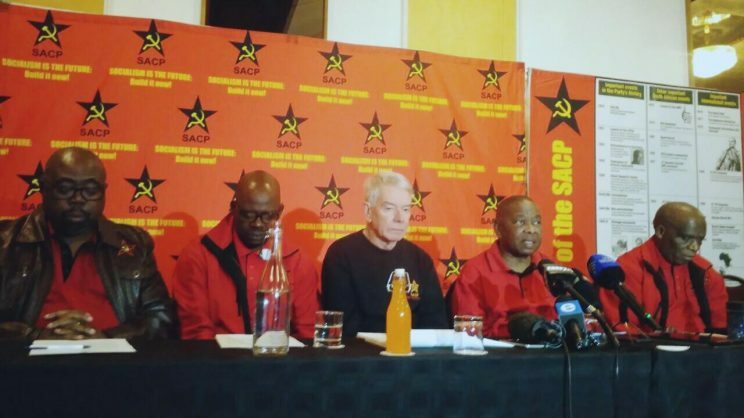 The SACP and other alliance partners, led by the governing ANC, will hold a scheduled meeting on Monday to discuss the country’s current state of affairs.